For over 70 years, Chick-fil-A has served customers with delicious food and a spirit of service and community. The restaurant is loved in the communities where it has had a long-standing presence. In Chick-fil-A’s headquarters in Atlanta, for example, many consumers have their own Chick-fil-A story and warm feelings about everything from peanut oil and “my pleasure” to the pickles. The familiarity with and trust in the brand runs deep in the communities in which it is already entrenched. Chick-fil-A’s meals are beloved among loyalists. However, the abundance of food choices makes it challenging for companies like Chick-fil-A to reach new consumers. Chick-fil-A needed to tell a story that would differentiate its brand and deepen connections with new and existing fans alike. Together with Chick-fil-A, we created “The Science of the Chicken Sandwich,” a campaign that inspires longtime loyalists and new fans to discover what’s at the heart of this much-loved menu item. 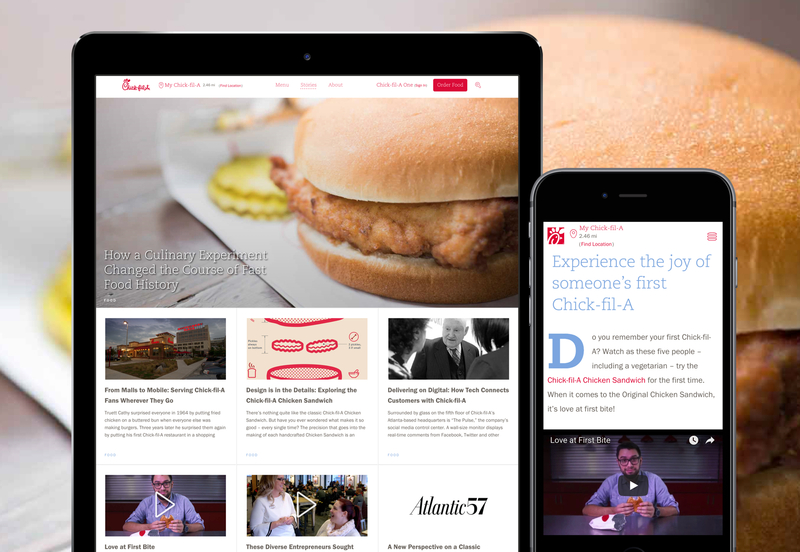 By providing a substantive, journalistic lens on the simple joy of a chicken sandwich, we offer people an approachable entry point into Chick-fil-A’s history and culture. Through this “high-low” approach, we seek to spark rediscovery and discussion of the Chick-fil-A brand across the country. Once we had developed our campaign theme, we crafted a constellation of social content that explores how the Chick-fil-A sandwich came to be—and the precision and thoughtfulness that goes into every bite today. We also developed a campaign distribution strategy, which identified culinary influencers and social channels to amplify the campaign.